I'm so happy to be able to share with you a layout that I created using the brand new "Make a Wish" collection from Webster's Pages! It brings together so much that I love: gold, pink, pastels, adorable little details that make me question whether I'm crafting with scrapbook supplies or candy. Seriously good enough to eat. Paper strips and pieces, stickers, punched bits, embellishments on a stick, flowers, doily, cord, epoxy stickers, thread...so many pretty things to compliment my sweet daughter. I don't really have a set formula or direction for the way I do things. I just tuck and add and adjust until it looks good. And I actually never secure anything until I'm pretty much done. So gluing can be tedious, but I like to change around so much that there's just no other way. I remember a time when they intimidated me. I mean, how in the world do you FIT everything into such a small space?? I've always been a really "full" scrapper...so being forced to hold back a little and focus on just a small handful of things per page was really tough for me. Since that time, I've made quite a few minis and though they are definitely one of the more time-consuming projects, they are now some of my favorites to do. They are the type of project that can be set out, displayed, and enjoyed over and over again. I recently created a mini to be used as a sample for a mini album kit offered in my shop. It's simple, pretty, uncomplicated, and allowed me to record some of my favorite memories from the past year. Can I admit that I ALWAYS struggle with covers? Whether to title them or not? Photo or no? Always having to resist the urge to PILE on flowers and other stuff? Ugh. Keep it simple, Erin. It'll be fine. I'm obsessed with gold foil- anything. Obsessed. Well, obsessed with gold in general. And the itty bitty die cuts that come with the new Prima "Tales of You & Me" ephemera pack. I had so much fun with this mini. How about you? Minis- love them? Hate them? Somewhere in between? I've gone back and forth between my favorite type of project to do...for the longest time, it was layouts. Then it was tags. Now I'm not so sure. Anyways, I'll see you guys soon okay? Hello! How About a Giveaway? Totally kidding. Well kind-of. I do miss this blog space and figured it was time to peek my head in and let you guys know what I've been up to. Good grief, when did life get so busy? I sometimes wonder how in the world I used to do a project a day. I must admit, I got burnt out as so many do. It's not uncommon to see designers get a little too caught up in the excitement, join too many design teams, and in the process lose the joy of just simply creating. That is exactly what happened to me. And that is why I stepped back. As a wife and as a mother of three, with over 100 animals to tend to on our happy hobby farm, there just simply wasn't enough time in the day. And after a while, I realized I still had so much love for beautiful product and the happiness that comes with crafting. I opened up an Etsy shop and started creating scrapbook kits, which I've discovered I love way too much. It really doesn't surprise me, however, after my time designing for C'est Magnifique and eventually co-creating the mixed media kits there with my sister. There's just something about colors, textures, flowers, and pretty things all brought together in one gorgeous collection of goodness. And today I'm sharing with you a giveaway that I have going on from my shop, which can be entered through my Facebook page. That's it! No purchase required. You are definitely welcome to come check out my shop at any time! I promise not to wait another 8 months before posting again. NEW from Prima: Garden Fable! Good morning everyone! 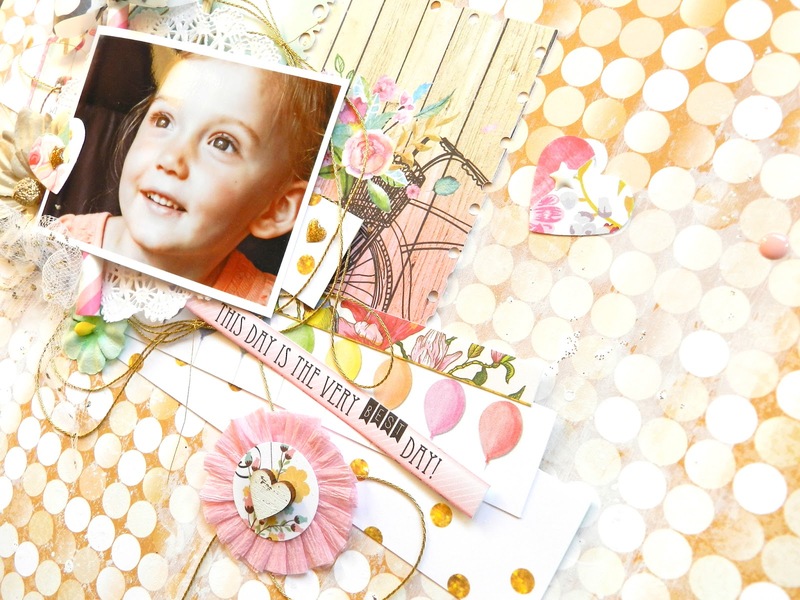 Today I'm super excited to share with you a brand NEW release from Prima: Garden Fable. It is a stunning, mixed media, vintage-inspired collection. An assortment of Prima metals were added and complimented the vintage bird houses quite nicely :). For more projects featuring this collection, as well as a GIVEAWAY, head on over to the Prima blog today!! NEW from Webster's Pages: Dream in Color! Good morning! 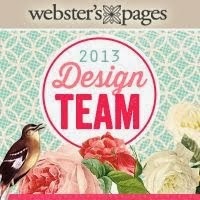 I hope the new month is off to a great start for you :) I'm checking in today with a couple of projects using the brand NEW "Dream in Color" collection from Webster's Pages! This one just couldn't get any more brighter or happier. What I love so much about Webster's is how their collections always reach my heart. From the images to the phrases to the colors. "You're My Favorite Work of Art"
I love that realistic imagery like the flower field of this "A Great Pair" paper is mixed in to this collection. It created the perfect backdrop for my always silly little girl :). I toned it down just a bit with some gesso before starting on my layers behind the photo. The "Tag & Prompt Stickers" are always just what I need for my titles. I've never been good at constructing long titles, so to have one compacted in a pretty little way like this one here is right up my alley. The mini banner was cut from the "Dream in Color" paper and paper punched. The "Storyteller Card Sheets" are great for cutting apart and adding to your layering. I also like to cut apart the paper straws like I did here. Next up, I've got a tag featuring the "Dream in Color" Collection as well! I may have mentioned previously that I'm really in love with purple at the moment- which is weird, because just a couple years back I remember chatting on a scrappy forum about our "nemesis colors"- and for me they were purple and orange. But nevertheless, I really love purple right now. So the "Field of Bliss" paper in this collection was the very first thing I grabbed when setting about making this tag. I love the gorgeous purple flowers with the golden hues against them- simply gorgeous. I always endeavor to create the perfect bow treatment for my tags to suit the overall look of it. Here I've used some vintage lace along with some gold trim and purple jute twine. The owl charm is an old favorite from Webster's that I've been holding on to for quite some time :). Again, the Tag & Prompt Stickers came to my rescue for the sentiment on this tag. And this one just so happened to perfectly match this paper ;). For the backdrop, I used a stunning chipboard piece from Blue Fern Studios. It was first primed with gesso before adding some embossing ink and then embossing powder from Shimmerz. Finally, some favorite new crystals from Prima. Thank-you for taking a look at my projects today! If you haven't yet, be sure to check out this entire new collection- as well as the other new releases- from Webster's Pages. Hey everyone! Long time, no see. I know. Lots and lots going on in my world...always. That never changes. I've lately withdrawn from social media for various reasons and also from blogging. 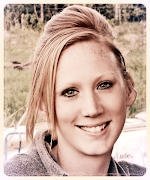 As many of you know, I also have a homesteading blog where I share a lot of our real life home practices which includes a from-scratch lifestyle, raising a variety of animals for different purposes, and striving to maintain simplicity- all the while raising 3 young kids and being a "stay at home mom" who works multiple part-time jobs both inside and outside of the home. So I've realized the need to disconnect a bit more from my online life and focus more of my available energy toward the everyday demands of my actual life. Get what I mean? This tag was created using my favorite of the new releases from Prima, the "Butterfly" Collection designed by Jodie Lee. To say I love this range would be an understatement.The patterns, images, and color palette are a dream come true. I'm really into purple at the moment, so this one is right up my alley. I've paired the papers with flowers new and old, as well as some gorgeous embellishments. The frame seen here is from the new "Timeless Memories" trinkets packs. Another new release from Prima is Frank Garcia's "The Archivist" collection. In Frank's true style, you will find lots of neutral colors and awesome patterns. This is one of those collections that you just have to have as it is so versatile. I've used one of the new Prima Mixed Media stamps here to create the messy butterfly background. And the brown egg carton flowers are amazing- they are super thick and durable which makes them perfect for mixed media! The "Bella Rouge" collection is bold and gorgeous. I've paired the papers here with new flowers and new Finnabair Art Ingredients. Microbeads, glass beads, and new Color Bloom sprays add to the textured mixed media background here. Another project featuring the "Butterfly" collection. A bit of fussy cutting here brought this tag to life :). If you've got little kids, you've got to have the "Bedtime Story" collection! The vintage children's book theme offers diversity and so much interest to an album like this one. Lots of new flowers, brads, wood icons, crystals, and other embellishments helped me out along the way. And as the week enters the weekend, I hope life is treating you well. We've had some unusually nice weather around here- a week ago it was -20 F and now we're in the 40's. Although we have several feet of snow yet and March typically shows us our biggest snow storms, it's a welcome break from our always-too-long winter. I'm starting my seeds inside this weekend and have been anxiously planning for our biggest garden yet with so many dreams and plans to be fulfilled. I wish you all the best. And I hope to see you soon!